<>, Inspire-O-Gram, "How to be a good friend"
Inspiration to help you thrive in the single life! You're receiving this free ezine because you signed up for it at www.inspiration-for-singles.com--which proves how smart, good-looking, suave, and debonair you really are! If you like Inspire-O-Gram, please forward it to your friends. Hi, fellow singleton, and welcome to the February issue of Inspire-O-Gram! This month's feature article came about from a suggestion by reader Mary Gemmil, in New Zealand. Thanks for the idea, Mary. with no worry or doubt. so afraid they'll run out. But that's not how life works. or a great joyful shout. "I want to be an encourager. Possibly my loftiest aspiration is to give my life to recognizing the good in others and, by expressing my heart to them, motivating them to be all that God intends for them to be. I want to be a part of seeing God's plan fulfilled in those I love by believing in them, expecting the best from them, and supporting them to that end." How about you? Do you want to be an encourager? This is one of the most fulfilling opportunities God gives us. If you've ever been hurt, lonely, or afraid, you know how much some honest, heartfelt encouragement meant to you. It isn't hard today to find someone who needs some encouragement. We are most like Jesus when we love and encourage someone. You can find a neat way to encourage someone on www.inspiration-for-singles.com. I call these little 4-page booklets Mini-encouragers. You can quickly print them out, stick them in an envelope and mail them, tuck one in somebody's lunch sack, or leave it on their desk. And the best part is they're absolutely f/ree! 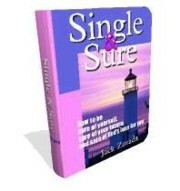 Single & Sure is one of the most encouraging books you'll read in 2008. This in-depth ebook will help you win over loneliness, frustration, heartaches, and self-esteem problems. You'll benefit from my nearly 40 years' experience as a single person. By learning from my trial and error, you won't have to go through many common mistakes yourself. Less pain, more gain. In addition, the f:ree bonus books will help you take control over your money, find a hobby that enriches your life, and pick yourself up when you're feeling down. All this for only $14.97, and with a moneyback guarantee to boot! Encourage yourself to a happier life with Single & Sure. That wraps up February's issue. I always welcome your comments and suggestions. You can write using this easy contact form. We'll see you again in March. From the frozen tundra of central Illinois, thanks for reading and God's best to you for a happy life!